Jailed Jewish Militant Protector or Terrorist? Controversy: Bomb-plot suspect Irv Rubin has been denounced by many, but some say he's a defender of his people. 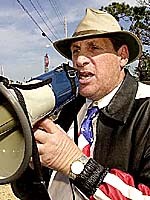 FOR years, Irv Rubin has been getting into people's faces, drowning out their speeches with shouting, picketing their meetings. A tall, beefy man with a voice that carries, he frequently uses a bullhorn to make it carry farther. Often, too, when shouting fails, he shoves and punches. Rubin, 56, learned his combative ways early, fighting name-callers on the streets of Montreal. Later, he found a home in the radical Jewish Defense League, which he joined a few years after its founding by a New York rabbi, Meir Kahane, in 1968. Since 1985, Rubin has been national chairman of the JDL, a group whose message has always been militant. Its motto "Never Again" refers to the Holocaust. To prevent another one, Kahane and his followers argued, Jews must be armed and ready to defend themselves by any means necessary. Hence the group's slogans: "For every Jew a .22," and "Keep Jews Alive with a .45." Now, Rubin finds himself behind bars. He and fellow JDL member Earl Krugel will be arraigned today on charges of plotting to bomb the King Fahd Mosque in Culver City and a field office of Lebanese American Rep. Darrell E. Issa (R-Vista). Both Rubin and Krugel are expected to plead not guilty. Federal authorities, who have tried to connect Rubin with violent attacks in the past, accuse him of conspiring to commit the same sort of terrorist acts for which he has long blamed -- and reviled -- others. He was isolated long before his arrest, denounced by Jewish leaders all over the country as representing no one. Rubin's lawyers declined requests for him to be interviewed at the federal detention center, where he's been held in solitary confinement since his Dec. 11 arrest, and he has been denied bail. His wife, Shelley, who spoke on his behalf, said that Rubin's belligerent manner helps him reach his objectives -- but that her husband of 21 years, the father of her two sons, is a decent, innocent man who drops everything to donate blood and risks crashing his car to rescue stray animals on the freeway. "He may have a gruff exterior, but people who know Irv know he's a lover, not a fighter," she said, adding, "but on the outside, he's a fighter." He does his fighting on a shoestring budget. He lives in a Monrovia condo for which he pays no rent because it's part of a family trust. He doesn't work -- except occasionally, serving legal papers. His wife says he sometimes gets paid to give speeches. Mostly though, he and his family live off checks from his wife's mother. Their sons, ages 12 and 20, don't have health insurance. His wife canceled the newspapers he reads to save money after he was arrested. They're asking for donations to pay Rubin's legal fees. Membership dues and donations to the JDL pay for Rubin's protests, his wife said. A neighbor said he regularly sees Rubin drive home in donated cars, which he then sells. Still, one way or another, he frequently makes his way around the country -- to show up as the lone opening day protester outside the Holy Land Experience, a Christian theme park in Orlando, Fla., run by a Jew bent on converting people to Jesus, or to plant himself outside the compound of the Aryan Nations in Idaho. In Orlando and other places, leaders of local Jewish organizations say his protests simply draw attention to things best ignored or dealt with more diplomatically. Website comment: The Anti-Defamation League run by Abe Foxman (below) on a $100 million dollar annual budget is dedicated to smearing the names of those whose views it opposes, and suppressing free speech. The ADL took a fat bribe to persuade President Clinton to pardon fraudster Marc Rich. The fighting words of the JDL set it apart from other Jewish organizations, as has the JDL's view of itself -- as the only group with the guts to do whatever it takes to protect Jews. At local Jewish festivals, Rubin and other JDL members often hand out leaflets, urging Jews to support them and not the mainstream Anti-Defamation League, a much older group with a similar abbreviated name. "The irony is that he's spent half his career harassing other Jews," said David Lehrer, who until recently was the longtime western regional director of the ADL. In a 1978 news conference, Rubin offered a $500 reward to anyone who "kills, maims or seriously injures" a member of the American Nazi Party -- an offer which prompted solicitation of murder charges that were dismissed years later. On the JDL Web site, he proudly displays video footage of a brawl he got into with Ku Klux Klansmen on the Jerry Springer show. Proudly, too, Rubin says he's lost count of his arrests, which number more than 40. In 1985, federal authorities named Rubin a suspect in the bombing death of Alex Odeh, regional director of the American Arab Anti-Discrimination Committee, in his office in Santa Ana. Rubin was never charged and denied involvement. But he publicly celebrated Odeh's murder, which remains unsolved. After the 1999 shooting at the Jewish Community Center in Granada Hills, thousands came together to speak out against violence. But Rubin, who interrupted Gov. Gray Davis' speech with shouts, had a different message -- against gun control and in favor of armed self-defense. "It wasn't the Aryan Nations. It was Irv Rubin, screaming like a maniac. . . . It was disgusting," Lehrer said. Under Kahane, who left the organization in the 1980s and was assassinated in 1990, the JDL was very vocal and growing. Its main cause was fighting Soviet mistreatment of Jews. Shelley Rubin contends that there are still thousands of members in JDL chapters across the country and around the world. But federal authorities say the group's strength long ago dwindled to perhaps a few dozen members. Los Angeles County Supervisor Zev Yaroslavsky, one of many local leaders who describe Rubin as the fringe of the fringe, said, "There are more teams in the American League than there are members of the Jewish Defense League." Shelley Rubin said the small turnouts at her husband's protests signify nothing. "He's learned you don't need to have a whole mass of people demonstrating," she said. "If there's a problem, he knows how to draw attention to that problem. He has refined the method of demonstrating." Refined is not the word Yaroslavsky uses. 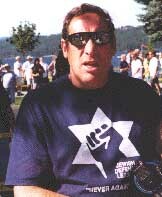 "I've been in a situation before where Irv and the Krugel boys would get into shoving matches with other Jews," he said, referring to Earl and twin brother Barry Krugel, 59. Yaroslavsky added that he once decided not to bring up gun control when speaking at Studio City's Temple Beth Hillel because Rubin was in the audience. So were a lot of senior citizens, he said. "He gets into fisticuffs with people nearly twice his age. I've seen it with my own eyes," said Yaroslavsky, who was in college when he first met Rubin. "I'd like to think that in his early days, Irv's heart was in the right place. But I think they all have a certain fascistic streak to them. If you don't agree with them, you get punched in the nose. There's no room for dissent, no room for another point of view." Diane Jacobs, 80, of Beverly Hills, sees it differently. A Holocaust survivor who worked in the resistance and whose entire family was killed by the Nazis, she has known Rubin since the 1970s. Like him, she has little good to say about Arabs. Someone has to take a stand, she said. "His message is stand up. Stand up and don't take any garbage from anybody. Don't take garbage from the bigots. Stand up for yourself," she said. "A lot of Jews, they think they're supposed to turn the other cheek, to just roll over. Honey, if I had done that back in Germany, I'd be 6 feet under with the rest of the people." Jacobs said she's seen Rubin clean up desecrated synagogues and Jewish cemeteries. She applauds his style of protest, even the shouting. "The law says we have freedom of speech. Nobody said anything about freedom of hearing," she said. The Rubins are against the Middle East peace process and want the Palestinians out of Israel, said Shelley Rubin. "Irv has always said that he would like all the Palestinians to come here to live and let Israel be Israel. He doesn't have anti-Arab feelings," she said. "But I will not try to hide the fact from you that we feel very threatened by the spread of Islam in this country. We believe that there's an Islam that they don't want you to know about, and that any religion that says that Jews are a lowly people who have to be subjugated and humiliated, we've got a problem with that." In a telephone conversation, she later expanded on those thoughts. "We see that the Muslims are trying to take over the country. That's what they do. They take over a place and then they want to put their own laws into effect." Such rhetoric is the reason that Brian Levin, director of the Center for the Study of Hate and Extremism at Cal State San Bernardino, put the JDL logo -- a fist and a star -- on his list of hate-group graphics. That decision prompted Rubin to contact him repeatedly in April and May of last year, Levin said. At first, Rubin calmly tried to argue that the JDL wasn't a hate group. When Levin didn't buy that, Rubin "got extremely combative," he said. He refused to swear off violence, one of the requirements for removal from the hate list, Levin said. "He's like a lot of the other extremists I study. He has a very narrow world view, very rigid," said Levin, a former New York policeman, who is Jewish. "People like me, he's already written off. I'm as bad as the rest of the world. In the end, he called me a lousy Jew, the same kind of sellout Jew who was responsible for the Holocaust," said Levin, whose father was a prisoner of war in Hitler's Germany. Shelley Rubin said her husband, whose working-class family came to Southern California from Montreal when he was 15, readied himself for his cause as a child "living in the shadow of the Holocaust." "Irv was a little boy and someone called him a dirty Jew. He must have been 6 or 7," she said. "He ran home crying and his mother said, 'Oh no, you go back and you fight.' "
The fighting spirit of the JDL attracted Shelley Rubin when she was a teenager in the San Gabriel Valley. In a scrapbook she kept, she pasted stories about the JDL's campaign for Soviet Jews. She admired Rubin from afar, she said. They met when she joined the JDL in 1979 and were married a year later. In the 1980s, Shelley Rubin worked briefly as a writer and editor for the B'nai B'rith Messenger, she said. Now, she works behind the scenes for the JDL, organizing and writing much of the content on the Web site. When the FBI searched Rubin's home Dec. 12, even she was surprised by Rubin's arsenal, she said. Agents found eight guns in the Rubins' bedroom. All were licensed and kept in cases, she said -- but she'd only known about one. FBI officials could not be reached for comment. The FBI alleges that Rubin chose the mosque and Issa's office as bombing targets and that he decided when the bombings would take place. According to the FBI complaint, Rubin spoke of letting people know that the JDL was active in a militant way. Talking about the indictment, which is based on FBI surveillance tapes of a JDL member-turned-informant, Shelley Rubin sees another plot -- hatched by people who have long wanted to silence her husband. She angrily speaks about Lehrer for speaking out so quickly against Rubin after his arrest. Her husband has devoted his life to protecting his people, she said. "He would rather not do it. He would rather there be no need for the JDL. But if Irv Rubin's not doing it, who is going to?" she said. "He learned the lesson of the Holocaust, that you have to fight back. That's what he does. But these charges are so wrong, so out of character."